Hey fourth graders! Join Every Kid in a Park for FREE!!! What in the World is a Tarantula Hawk? What is the polyphagous shot hole borer & how much damage can one tiny bug cause? You grab your leash, and your dog automatically starts heading for the door. He knows it’s time for a walk. Now its time to learn how to properly how to hike with a dog. But this time it’s no ordinary walk around the neighborhood. 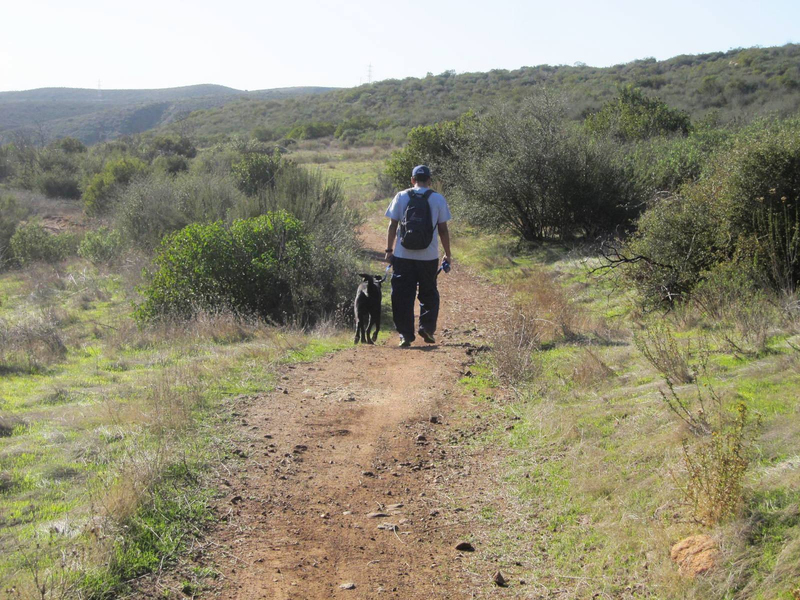 This time you’ve decided to go for a hike in a San Diego County park and you’re bringing your canine companion along for the journey. But now y ou need to learn how to hike with a dog in San Diego County. The good news is dogs are allowed at virtually all County parks. The only exceptions are Wilderness Gardens Preserve and the trails at Agua Caliente. Assistance or guide dogs are always welcome at all parks as long as they are in compliance with all regulations and check in with park staff. First, plan out your hike. How long is the trail you’re hiking and what’s the terrain like? You should know your dog’s fitness level so you can match that with the type of trail you choose. You can check out all the County parks trails online. Your dog should be up-to-date on vaccines and have a collar or been treated to prevent ticks and fleas. Also make sure your four-legged friend has current ID tags and a well-fitted collar in case you get separated. If your dog does become lost, contact the County of San Diego Department of Animal Services. Make sure the time of day you choose to hike with your dog is appropriate temperature-wise. Unless you hike with your dog often and they are used to that type of rigorous exercise, they could succumb to heat exhaustion. Dogs are much more susceptible to heat stroke than humans. Dogs’ only sweat glands are on their feet. If the ground is too hot for your hand, it’s too hot for your dog’s paws. Always have plenty of water for both you and your dog. It’s better to bring along a little extra than not enough. You might also want to pack a few doggie treats and search for a shaded area to take your breaks. Stay on the marked trail. In all County parks, dogs are required to be kept on a leash no longer than 6 feet in length at all times. 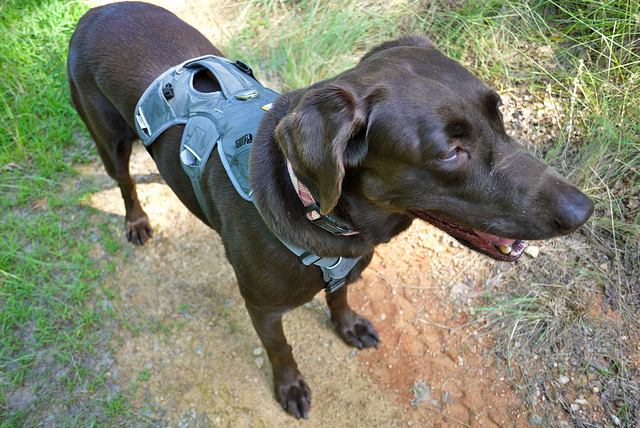 A leash prevents dogs from becoming lost and protects them from having an unexpected encounter with a rattlesnake, mountain lion or a sick or injured animal. Make sure to maintain control of your dog at all times. Dogs that are out of control or that pose a demonstrated risk to others may be asked to leave by a park ranger. Always clean up after your dog. Practice the Leave No Trace principles that allow everyone to enjoy our parks. If you decide to make it a weekend or an overnight in a County park with camping, the fee for dogs in camping parks is just $1 per dog per night. You must be able to furnish current license and vaccination information as well. Know how to how to hike with a dog. Have you ever found yourself in a sticky and prickly situation on a trail? 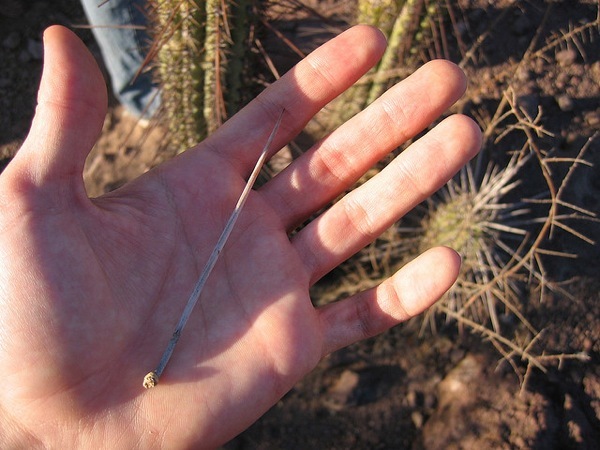 Have you wondered how you were going to get those painful cactus barbs out of your hand, arm, or maybe, leg? Some of them are very large, but some are so small they break before you can get them out! Well, one of our park rangers has some good tips on how to remove cactus barbs. if you ever find yourself stuck with some barbs., here is how to remove them. Easily and quickly…you just need the right tools! to remove those cactus barbs.